The idea of adding some warning for the non-HTTPS websites is not new, it was planned from 2014. As Expected, From First Half of 2017, New Versions of Firefox & Chrome Will Warn Non-HTTPS Websites as Insecure. After availability of Free Let’s Encrypt SSL certificate as well as low cost DV SSL (read the comparison of Free Let’s Encrypt SSL with paid DV SSL), there can not be much reasons for the webmasters not to upgrade their websites. To upgrade the Firefox browser, simply go to Firefox > About Firefox. They want to avoid alarming the user but at the same time they want to secure connections. Firefox 51 will also adopted a similar system in the next stable build, which is instead already available from some release in the developer version. The main obstacles so far dismissed the companies from HTTPS have been minimised the problems with initiatives like Let’s Encrypt which made the implementation cost to zero. Also HTTP/2 factually need HTTPS in real life. These set of upgrades was quite expected and the webmasters who has not yet upgraded but earning huge money via Adverts really need to be penalised and delisted by the search engines. However, we have not seen any serious effort by Google AdSense in this process despite Google’s false promise of higher SERP for the websites hosted on secured servers. This Article Has Been Shared 9383 Times! It is possible to use your old Computer as web server to host your own website or blog. In this article, we will give you the basic principle on how to create a home web server of your own. Platform as a Service (PaaS) refers to a service in the cloud a computing platform is for developers of Web applications without buying hardware and software. 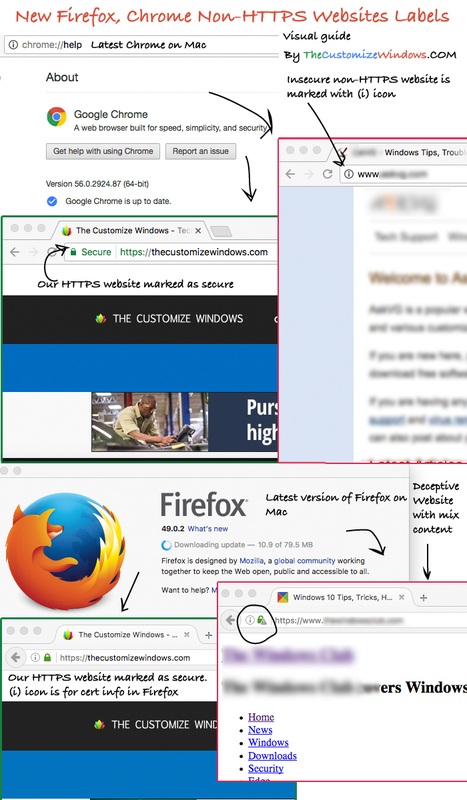 Cite this article as: Abhishek Ghosh, "New Firefox, Chrome Will Warn Non-HTTPS Websites as Insecure," in The Customize Windows, February 3, 2017, April 21, 2019, https://thecustomizewindows.com/2017/02/new-firefox-chrome-will-warn-non-https-websites-insecure/.